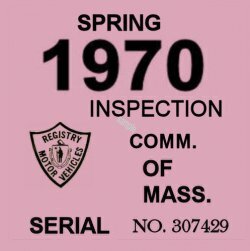 1970 Massachusetts SPRING INSPECTION Sticker - $20.00 : Bob Hoyts Classic Inspection Stickers, Add a Final Touch to your Restoration! This 1970 Massachusetts SPRING INSPECTION Sticker. was restored and reproduced close to the original, both front and back. They were originally issued from April to October, 1970. These have our patented "peel and stick" format in beautiful high quality paper and they attach to the inside passenger side of the windshield.